Hezekiah's Prayer - Can we make it ours? 2 Kings 19:14-17 says, "And Hezekiah received the letter from the hand of the messengers, and read it; and Hezekiah went up to the house of the LORD, and spread it before the LORD. 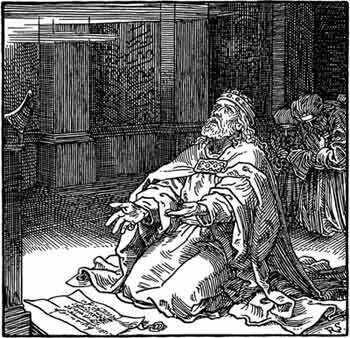 15 Then Hezekiah prayed before the LORD, and said: "O LORD God of Israel, the One who dwells between the cherubim, You are God, You alone, of all the kingdoms of the earth ... see and hear the words of Sennacherib, which he has sent to reproach the living God." When I read this portion about Hezekiah's prayer, I couldn't get past the first verse where it describes how he "went up to the house of the Lord, and spread [Sennacherib's letter] before the Lord." Suddenly it seemed as if my heart would burst with grief and I couldn't restrain my tears. I found myself overwhelmed by the reproach that is being brought against the name of Jesus in the world today. So many things came flooding into my heart as I wept, and all I could do was just spread them all out before the Lord like Hezekiah did, and cry out for His intervention. As he reminded God in verse 17, "Truly, LORD, the kings of Assyria have laid waste the nations and their lands", I equated this to how in modern times the vanity of this world and the pride of man have decimated the Christian heritage of so many nations. 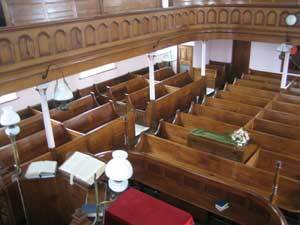 Wales of course has a special place in our hearts, but the rest of the U.K. and the U.S.A. in particular, as well as most of the "Western world", have witnessed a major exodus from the Church. And in many cases Bible believing Christians are scorned and even harassed by the encroachment of godlessness and secular humanism. On the international scene, there are so many elements of violence and injustice and inhumanity that come like shock waves against any sense of decency or civility and compassion. Zimbabwe, for one, is a blatant example of heartless megalomania. The ongoing struggle for some semblance of peace around Israel is like a slap in God's face. And the flourishing debacle in the ravaged "petrol-haven" of the Middle East is just one more item in a very long list of this world's maladies, all fruit of unbridled selfishness and impiety. And even in the Christian world during the last few months there has been a growing controversy in the Body about what is taking place in Lakeland, Florida. The commandment to "love one another" seems to have gotten tossed out the window along with John 17. And now that the secular media has caught wind of a "good story", they are openly airing their contempt of Christendom and our God. Unbelievers must certainly look on and wonder what Christianity can possibly have to offer them. So these are some of the things we've been "spreading out before the Lord" lately. I would like to encourage you to give a read to chapters 18 and 19 of 2nd. Kings, and ask the Lord to put things on your heart to spread out before Him in prayer. Then let us join together with Hezekiah's cry in verse 19, "Now therefore, O LORD our God, I pray, save us from his hand (the prince of this world), that all the kingdoms of the earth may know that You are the LORD God, You alone." I'm sorry this is not an easy two-minute prayer request, but will require an investment of your time. I also apologize that this is a bit longer than my usual updates. However I truly believe that we, the Body of Christ, are in need of doing some serious praying! If the world is ever to know that Jesus is Lord, we all have our work cut out for us. Thank you for praying - good things are happening! The past two weeks have flown by somehow since I sent out our last update. There has been a lot happening and I won't try to catch up on everything. But this picture expresses what things feel like on the larger scale. 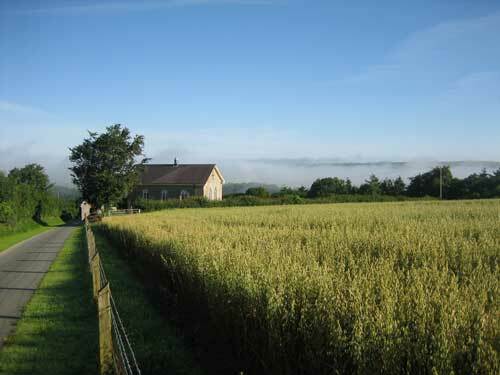 The oats in the field above the chapel are just starting to turn color, ripening for the approaching harvest. It has been a slow process as they were planted last fall, but the time is coming. So it seems that the spiritual fields of Wales are slowly getting closer to a turning of color as well. We've been involved in several events during the last month that accentuate the expectancy of things to come in different sectors of the Body here. I'm quite sure these oats will be harvested and stored before we see any major breakthroughs in the spiritual realm. But things are definitely happening and people are praying and talking about what the Lord has in store. For example, I'm sure you remember back in March when I asked you to pray about the situation of teen suicides in Bridgend. Well, I recently got some exciting news of things beginning to change there. Several young people have given their lives to Jesus and are shining light into the darkness with great hope! If you'd like to read more, here is a report from the Solid Rock Youth Center there. Also this last week was the first week of Celebration Summer, a follow on of the Celebration For The Nations that took place in South Wales last summer. Although it was a much smaller venue as you can see here, there were several hundred in attendance, and the "heat was on" with the spiritual fervor in spite of the chilly summer weather we're having. It was very stimulating to participate in the first few days of this event. Again there was a large contingent of young believers from South Korea whose surrender and commitment was very inspiring. It was reminiscent of the Jesus movement when I got saved back in the early 70's when so many young people gave their all to become disciples of Jesus and just go after His calling with their lives. There is more that I'd like to share but will save it for our next update. 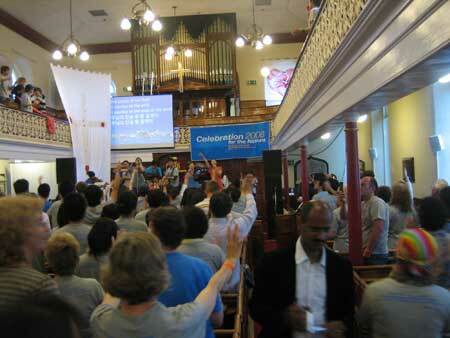 Thank you for your prayers for us and your continued interest and prayers for the hearts of Wales and the nations. "I Need Thee Every Hour!" The Welsh summer has not really warmed up yet, and daytime highs have averaged in the low 60's. But in spite of this the grass in the chapel cemetery has been growing wildly. 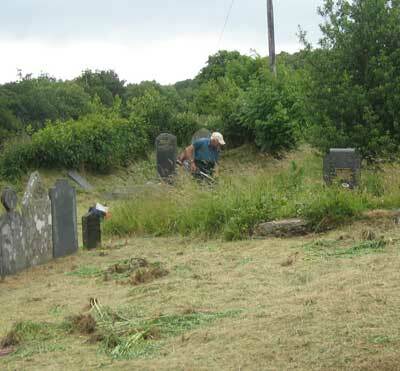 At times we join in with some of the work, and recently I have helped with "strimming" this overgrown section which was waist high and a tedious job. Working through the tenacious growth of these green grasses caused me to reflect on how our thought life is very similar to this task. Although we know the truths of scripture, and the many "great and precious promises", yet the world and its way of thinking constantly bombards our mind and our soul and tends to fills us with nonsense and disbelief. And if we are not diligent to keep it at bay, it quickly challenges the clarity and peace we have received from the Lord. Paul says in 2 Corinthians 10:4-5, "For the weapons of our warfare are not carnal but mighty in God for pulling down strongholds, 5 casting down arguments and every high thing that exalts itself against the knowledge of God, bringing every thought into captivity to the obedience of Christ." And so it is that we need to keep our guard up and be diligent with our spiritual "strimming" by allowing the Word of Christ to dwell abundantly in our hearts. We are now into our fourth year of our intercessory mission here, and there have been plenty of times that thoughts come along that challenge and stretch us. And we are so thankful for the strength and encouragement that the Lord continues to give us through his word and his people. We were at a small prayer gathering last week and someone present gave us a wonderful word from Isaiah 1:19 which says, "If you are willing and obedient, you shall eat the good of the land." Today at the chapel I found myself singing "I Need Thee Every Hour", and realized how literally true that is! Our conscientious dependence on Him must be total and very frequent if we are to keep the weeds of the world under control and our hearts fixed upon Jesus, the author and finisher of our faith!